Back to Butter – Got Culture? Whisk the ingredients together in a large bowl (I used the one from my mixer). Cover with plastic wrap and let stand for 12-48 hours. Put the cream in a bowl for a stand mixer (if it’s not already), attach to mixer and cover the bowl with plastic wrap (or a pouring shield if you have one). Mix on high for about 4 minutes until the butter starts to form a ball. You’ll know when it’s turning into butter because the plastic wrap will suddenly become totally spattered on. Strain the liquid and solids in a fine sieve over a bowl. 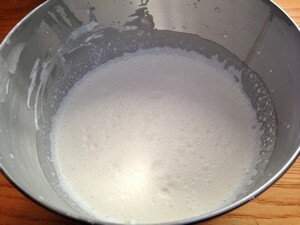 Place the solids back in the mixing bowl and knead to get rid of any excess buttermilk. Pour off the excess buttermilk. 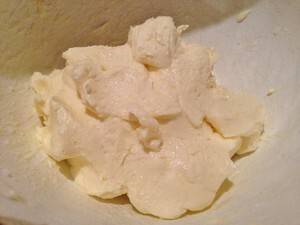 Pour ¼ cup of the ice water over the butter and knead again, pouring off the excess buttermilk. Repeat until the water is almost clear. Knead the butter until all the water is gone. Form the butter into a cylinder or block, wrap it in cheese cloth and gently squeeze to get rid of any remaining moisture. 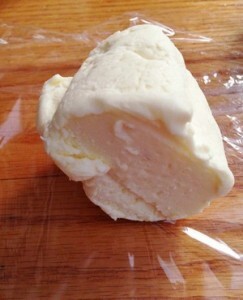 Remove the cheese cloth and wrap the butter in plastic wrap. Serve and enjoy! My verdict: Although you need to let this cultivate (I left it about 24 hours), it comes together so much faster than just whipping cream in a mixer! Mine had a nice, sweet taste and a smooth texture. I cut it up and froze most of it for a later use. I was lucky enough to find some decent cream that hadn’t been ultra-pasteurized and didn’t break the bank, so my (close to a) pound of butter cost about $6 in materials – definitely worth it! 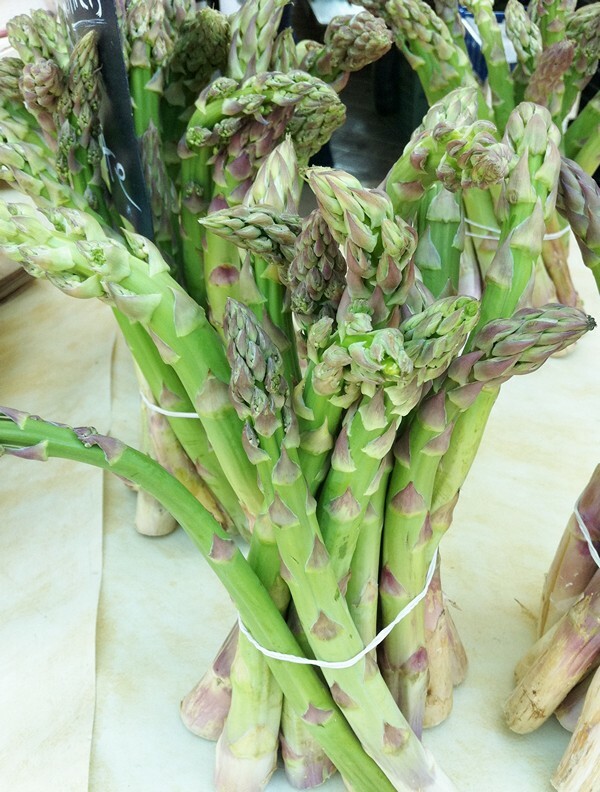 Recipes for Asparagus: Steam, Grill, or Roast and Enjoy! This time of year, recipes for asparagus are as plentiful as tree pollen (but not quite as excessive as recipes for ramps). The Accidental Locavore shares recipes and ideas for asparagus (to see how to pick asparagus check out the “How To” section). No recipes needed to grill asparagus, one of my favorite ways to cook them. If they’re not too big, just toss them in some olive oil and sprinkle with salt and pepper, and throw them on the grill for 5-10 minutes, turn after a couple of minutes and cook until they start to have grill marks, are flexible and cooked through. If you’re working with bigger stalks, you might want to steam them (I use the microwave) for 4 minutes, then toss in olive oil and grill, or skip the steaming and just cook them a little longer over slightly lower heat (charred is not good). This may sound a little crazy: a great recipe for grilling asparagus is to marinate them in a mayonnaise mix, then grill them. This recipe is adapted from Food & Wine. Feel free to substitute and/or add things like mustard, hot sauce, or sprinkle with something like Parmesan Cheese before or after grilling. Added bonus? The asparagus won’t stick to the grill. 6 servings if you’re not too greedy. Light a grill. In a shallow dish, whisk the mayonnaise with all the other ingredients, except the asparagus. Add the asparagus, toss and let sit for 30 minutes. Grill the asparagus over moderately high heat, turning to cook evenly, until tender, about 5-10 minutes. Asparagus are also good roasted. Same principle as grilling, just toss in olive oil, salt and pepper and roast them in a 400 degree oven for 15-20 minutes until they’re cooked through. I’ve roasted them with sprinkles of goat cheese and herbs de Provence, ok but not great. Better is some lemon zest, and grated Parmesan (you can add before they go in, or sprinkle on before serving. 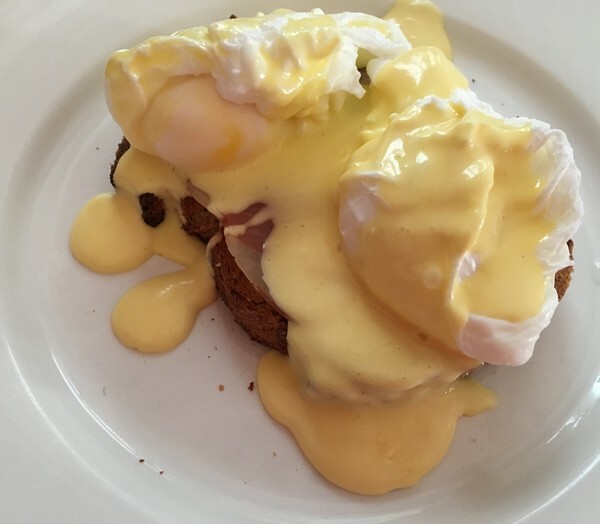 When you steam them (4-5 minutes in the microwave and they keep their color), or (steam them in a pan) on top of the stove, to jazz them up a little hollandaise sauce is delicious, decadent and easy to make. Recently I made an “homage to hollandaise” with about ½ cup crème fraiche, 2 tablespoons whole grain mustard and a little squeeze of lemon juice mixed together and served with roasted asparagus. Not quite the guilt of hollandaise. What’s your favorite recipe for asparagus? 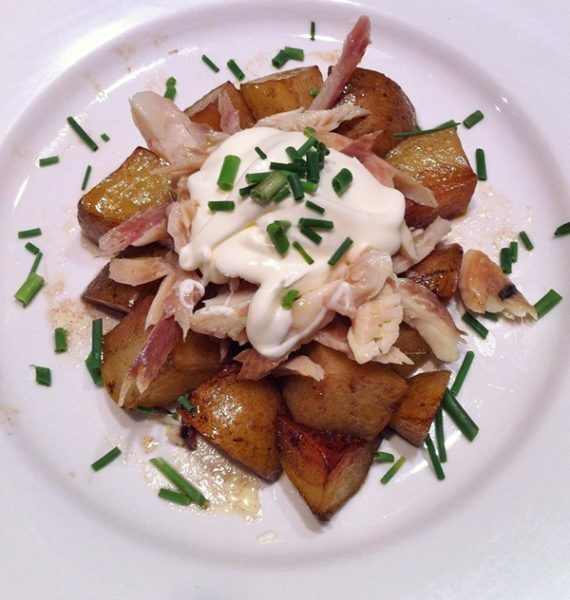 As things sometime turn out, the Accidental Locavore had just finished reading a recipe for smoked trout with potatoes from April Bloomfield’s A Girl and Her Pig when my husband started talking about how much he liked smoked trout, a factoid I filed away for future reference. A week later I was at the last indoor version of the Rhinebeck Farmer’s Market, where one of the vendors had some lovely looking smoked trout. I got one and proceeded to give April’s recipe a shot. The original recipe was for 4 people, this was adapted to feed 2. Put the potatoes in a bowl, drizzle them with olive oil and balsamic vinegar, sprinkle with salt and toss well. Arrange the potatoes in a mound in the middle of a baking dish (don’t spread them out). Drizzle with the liquid from the bowl. Sprinkle the garlic and thyme around the potatoes. Add ½ cup of water to the pan, but not on top of the potatoes. Cover with two layers of aluminum foil. Bake for about 40 minutes until the potatoes are tender. 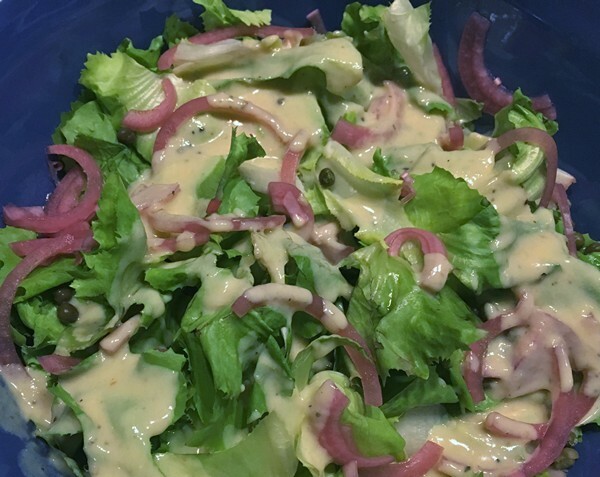 While the potatoes are cooking, make the dressing. In a small container with a lid, combine the lemon juice, olive oil and salt. Shake well. 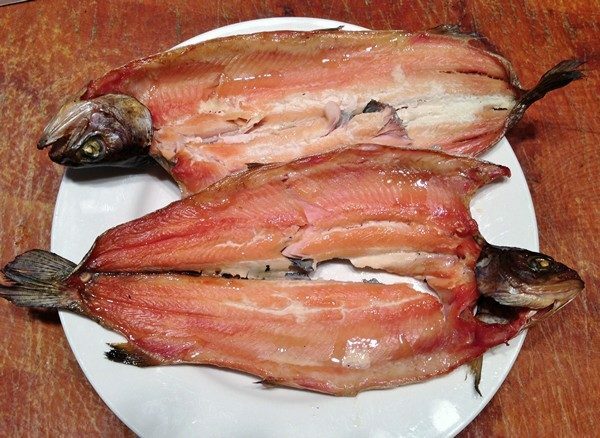 Peel the skin off the smoked trout. Pull the fillets from the center bone. Check for small pin bones and remove them. Break the trout into bite-sized pieces and put in a small bowl. Add ½ the dressing and toss to combine. When the potatoes are tender, remove the foil, give a quick stir and cook for another 15 minutes. With a slotted spoon, remove the potatoes and place in a small bowl, leaving any oil behind. Toss with the rest of the dressing. To serve: arrange the potatoes on a plate. Scatter the smoked trout on the potatoes. Add a dollop of crème frâiche to each plate and garnish with the chives. Serve and enjoy! Update: I had a great smoked trout salad recently and it encouraged me to smoke some trout. It’s quick and easy. Just plop a couple of trout on the smoker for about 2 hours et voilà! Then, I remembered how good this salad had been and looked it up. 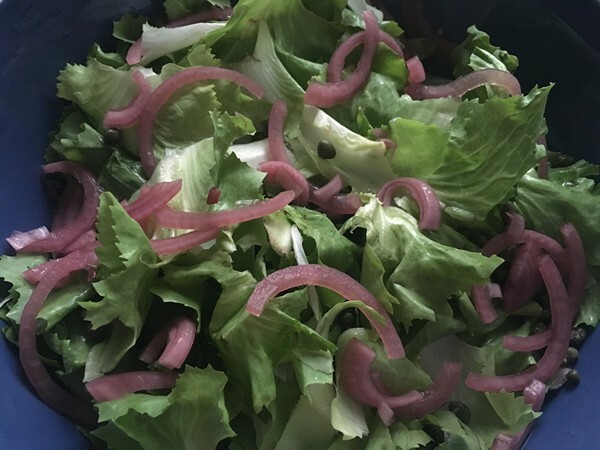 By that time, I’d already boiled the potatoes, so tossed them into the balsamic dressing to which I added a tablespoon of coarse grain mustard. Still great!